Now is the perfect time to schedule your classes to come to the library for some specialized library instruction. Our space is limited so schedule early! 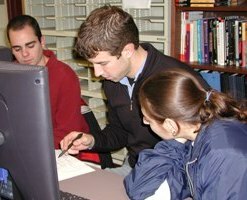 The research strategies for our huge selection of specialized subject databases, web site evaluation, library catalog searching and citation software are just a few of the skills we teach. Sessions can be held during normal class meetings or at any other time, in the library’s state-of-the-art classroom or your usual meeting place. These sessions are tailored to the needs of each course and assignment. Bring your students in and give them the research edge. Don’t have time to devote a full class period? Consider having a librarian come by for a 15 minute library preview at the beginning or end of a class or consult with a subject specialist to have a custom resource page on the library web site. And, of course, the library isn’t just for students. If you are interested in increasing your own knowledge of any of our resources we would be happy to meet with you one-on-one or to provide a custom workshop for your group, team or department. Schedule a time to come in now and start your students and yourself on the path to using the library resources to their fullest potential. In addition to classes scheduled at the request of course instructors, Falvey librarians also offer sign-up classes on various topics of interest, open to all members of the University community. So whether you are a student or a member of the staff or faculty, be sure to watch the Falvey news blog, Campus Currents and the Wildcat Newswire for announcements. Do you have a suggestion for a sign-up class on a particular resource? Send it to Barbara Quintiliano, instructional design librarian or contact her at 610-519-5207.